Where are all the Christmas bicycles? Christmas has come and gone, but there is something that is ostensibly missing (well at least for me). Where are all the children on their new Christmas bicycles? It was Christmas Day, and my family as always was up early because all my nephews and niece were over at my mother's house to unwrap their gifts. It is our great holiday tradition that we try and do everything together at my mother's house because she lives on a cul-de-sac and it make it easier for the kids to play outside. As always on Christmas Day, I like to sit outside and watch the kids play with their new toys and some how live simultaneously through them because I remember when I use to be that joyful to receive a new gift. I just couldn't wait to get outside and play with my new toys. One of my favorite parts of people watching on Christmas Day is watching all the kids on their new bicycles. I don't know about you, but there is something about Christmas and a new bike. 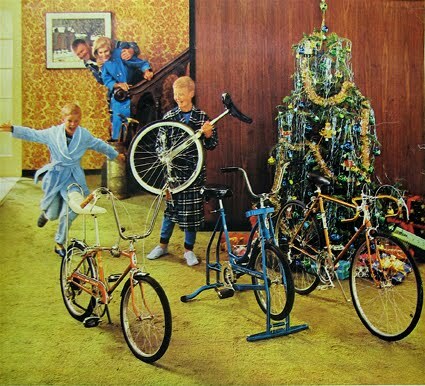 I'm not sure about the tradition up north, but it is really a big deal down south to get a new bicycle on Christmas. The two just goes hand and hand. It's like a rite of passage or something. Well, this Christmas there was something different. When the kids went outside to play there was something very different that greeted them. Where were all the other children? We're talking about a neighborhood that is filled with kids, but yet there were no children outside playing. Maybe everyone had went out of town this year, I thought, but instantly erased that illogical thought from my mind when I saw the mountains of Christmas debris that was piling up in front of everyone's yard as people began to clear through the rubble of Christmas and bring their collective trash bins to the front of their houses. So where in the world were the children? Maybe it's just me, but I remember a time when we could barely drive down the road in our neighborhood because there were so many children on bicycles and you didn't know what direction they would be coming from. And trust me, that was not that long ago. So as I walked beside one of my nephews as he rode his bicycle, I started to glance at some of the trash that people had put out. What I noticed is perhaps the reason why I no longer see children outside on bicycles. There was every type of video game console and computer you could imagine lining up my mother's street. Children don't have a reason to come outside anymore. All their entertainment is home based now. They don't view bicycles, like I did, as tools to explore the world (or neighborhood) around them. I guess that is something that is so passe, or maybe I'm just getting old (Shudder!). But as I look at a world where childhood obesity and diabetes are rising, I wonder why we don't listen to the what the First Lady is saying and 'Let's Move'! And no, doing Michael Jackson dance moves on your Kinect does not count...LOL! If you want your children to play outside then you need to get them gifts that can only be used outside. Maybe it's just me. But where in the hell are all the Christmas bicycles? Please tell me it was just my neighborhood and not yours. Well as one raised in the north, if you got a bike at Christmas, you waited anxiously for springlike weather so that could ride it. But we still went outside and played in the snow. I remember helping a friend with planning activities for her child's outdoor graduation party. I suggested double-Dutch. To my surprise, most of the girls there didn't even know how to jump single. I was stunned. I didn't expect everyone to jump double-dutch,but to not know how to jump single was unbelievable. Me and some of the other women had to give lessons. Times have changed and continue to change. Kids today have grown up with computers and video games. But I can say that i notice kids being in more organized sports and school activities. However, I don't really see children playing with one another within their communities. To me that is sad because being outside playing really is a carefree time and some of my best childhood memories involve bring outside playing with kids from the hood.